The Spotlight posts are back again! For this post, I decided to interview Andy Houghton, an IT professional and a member of Canada’s Technology Triangle .NET User Group, who regularly attends the sessions and full day workshops. Andy understands that an important aspect in the IT field is continuous learning. He is a super star on the Microsoft Virtual Academy track, achieving Platinum status with over 14K points. Andy is currently ranked among the Top 10 overall MVA students in Canada. 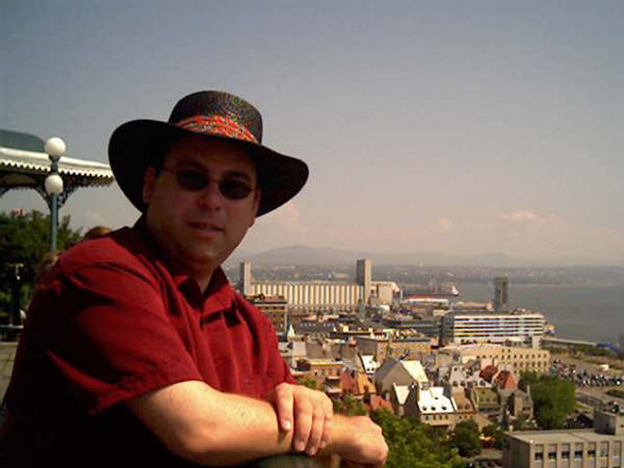 Andy Houghton has been in the IT community since 1988. He has held many IT roles from Help Desk to Programmer to IT Manager. Andy enjoys working, and helping others grow, in technology. He is currently working on a contract at the Co-operators Insurance Company in Guelph, Ontario. Outside of work, Andy and his wife provide a safe place for children as foster parents. He also has a 19 year old daughter who recently completed her first year of university. I had a chance to ask Andy some questions about how he got started with MVA, and how it has impacted his career. 1) When did you first get started with Microsoft Virtual Academy (MVA)? I started using MVA on June 24th, 2011, which was the second week it was available. 2) How did you hear about it? I received an email from Microsoft. 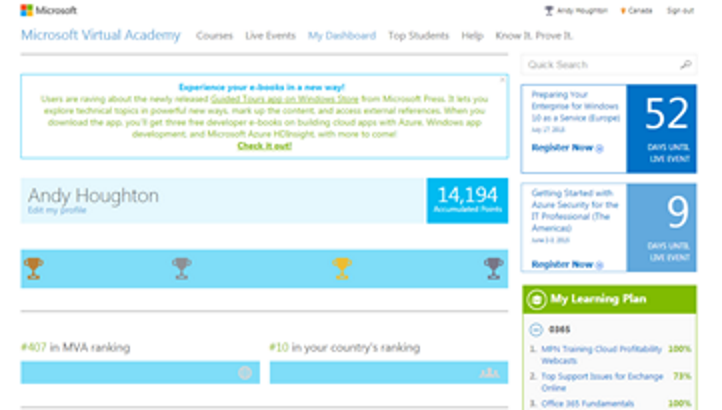 3) How many courses have you completed through MVA to date? To date, I have completed about 120 courses. 4) What is your motivation for pursuing the MVA courses? Keeping current on new technology. 5) How has your career changed since taking the MVA courses? I have been able to improve my skills and get more contracts. I also feel more confident that what I am telling customers is correct because I heard it on MVA. Sometimes in the past, you created your own solution and it was not the best practice. When I learn something on MVA I know it is the best practice, because it is coming from Microsoft. 6) Of all the courses you’ve taken, what is your favourite MVA course? And who is your favourite MVA instructor? The OneNote training was my favourite because it is what I use to keep track of my IT resources. I do not have a favourite instructor I find all of them really knowledgeable and easy to listen to. 7) Are there any additional resources you use to continue to learn and grow in your field of expertise? Besides MVA, I also use MSDN and TechNet websites. There is an abundance of user created content online which is really useful. Office 365 also has some separate resources that you can search for online. I use OneNote notebooks to keep track of the best resources. I also make note of those resources that are not so good, so I know to avoid them in the future. 8) What advice can you give to new grads that are entering the workforce? Never stop learning. I received one piece of advice from an MVA course that I will always remember. I am not sure what course it was, I believe it was an Office 365 course where the instructor said. If you want to continue to advance your career and make more money, “Be more valuable to your employer this year then you were last year”. The key to success in this field is the ability to change, and adapt, as new technologies emerge. Microsoft Virtual Academy is one of the many resources available online that help you to hone your skills, and keep current, at no cost to you. Thanks Andy for participating in this month’s Spotlight post! If you enjoy keeping up with the technology trends, I highly recommend that you register for Microsoft Virtual Academy and create your own personal learning plan. While you’re at it be sure to check out the upcoming Windows 10 Developer Readiness Canadian Webcast. Online resources are awesome, but in-person events are just as important, both for the learning and the networking opportunities. If you’re in the GTA or surrounding area, register for the Toronto stop of the Build Tour as well as for the Build Highlights sessions that both I and fellow Microsoft MVP, Tom Walker, will be running for our local area .NET User Groups: London Developers .NET Meetup Group and Canada’s Technology Triangle .NET User Group (Kitchener).